The Gray Wolf (also known as the Timber Wolf) is the largest member of the dog family, and lives in packs (groups). Gray Wolves range in color from grizzled gray or black to all-white. As the ancestor of the domestic dog, the Gray Wolf resembles German Shepherds or Malamutes. Wolves are mainly found in the most northern parts of the Northern Hemisphere. Wolves howl as a signal to other wolves, telling of the beginning and ending of a hunt, of a wolf separated from its pack, as a warning to other wolf packs, and simply for the fun of it. Gray Wolves have strong jaws with sharp teeth, including long canine teeth which tear flesh. Adults are about 4.5 feet long and weight about 80 pounds. 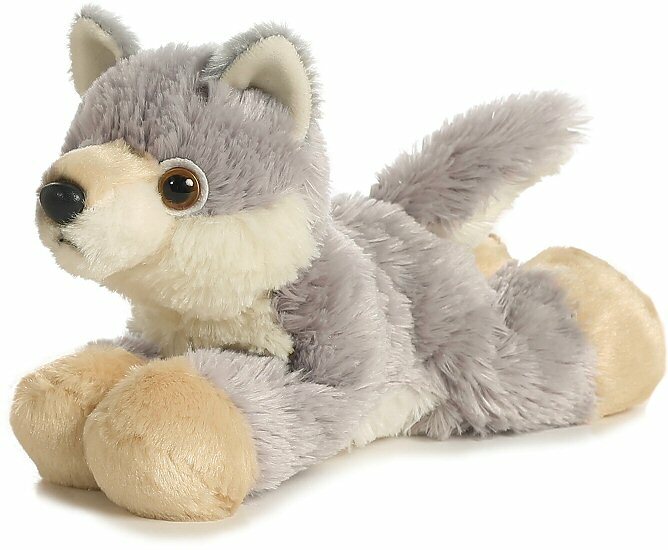 This adorable stuffed wolf has soft gray and light brown fur, floppy tail, perky ears, and warm brown eyes.